I can find no identifying information on the photo. It looks, to me, to have been taken in the 1950s, judging by Pete’s hair and no beard. Pete Seeger at a typewriter, probably in the 1950s. It’s an electric typewriter, I think, seeing a cord coming out of the back. Probably a Royal (I’m not great at identifying typewriters, you know). Was this taken at Pete’s home in Beacon? Perhaps. Can you help in identifying the time and place of this photo? Somebody put a video collage of Pete together with Tish Hinojosa‘s cut off of a 1998 Pete Seeger tribute album, “Festival of Flowers,” just in the last few days. Tish Hinojosa’s voice constantly stuns me with its clarity; I think my first Tish album purchase is 20 years old now. We should hear her more often. Interesting morning. Is there anyone who does not have a Pete Seeger memory? 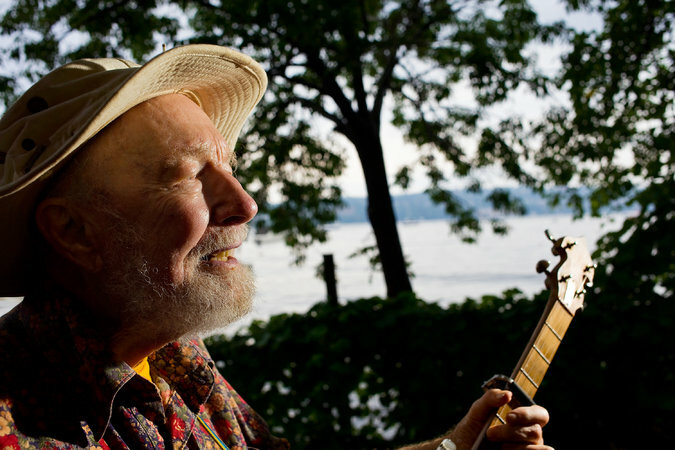 Pete Seeger's great heart was matched only by his commitment to social justice. My thoughts and prayers are with his family and friends. The Pete Seeger Appreciation page was set up many months ago — in fact founder Jim Capaldi died last December, with his family carrying it on. A good place to start, maybe. 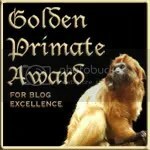 “@RayBeckerman: "Dink's Song" Pete Seeger http://t.co/1K4wll4EfZ #music #PeteSeeger” thanks Ray! What great tributes have you seen to Pete today? Give us a link in comments, share the good stuff. Just got the news that Pete Seeger died. He was 94. Such a loss for American music, to American music, and to history and art. I love the Andrew Sullivan photo the New York Times used — it reminds me of the best way to hear Pete, in the out-of-doors, near the Hudson, in the summer, with a small audience who could be coerced to sing along. Pete was an alumnus of Camp Rising Sun (of the L. A. Jonas Foundation) near Rhinebeck, New York, from the very early days. In 1974, between concerts at large venues with Arlo Guthrie, and on his way back home to Beacon, Pete stopped and spent a day with us at the camp. He was , as always, wonderfully gracious, other than outward appearances indistinguishable from the 14- and 15-year boys in excitement to be having fun, exploring nature, and then leading us all in songs. But despite his down-home-everybody-welcome demeanor, Seeger drove great movements, and pushed the arcs of history in wonderful directions throughout his life. Pete was an anchor for Woody Guthrie in New York, and sometimes a rival. As Pete told it, everybody loved Woody and always came to a performance to hear Woody sing. It was often Pete who pushed Woody out front; no mistake that Woody’s famous New Year’s resolutions from 1942 included “Love Pete” among them. Having learned from the Lomaxes at the Library of Congress, Pete recorded history in songs, preserving old tunes, making foreign tunes popular, and re-arranging verses here and there. Pete revealed, discovered, or pushed the music of a family domestic (“500 Miles”), Cuban revolutionary poets (“Guantanamera”), his engineer sister (“Going to be an Engineer”), and hymn books. Pete taught a song to seminar attendees at the Highlands School in Kentucky, people who went on to do great things with that song. The song was “We Shall Overcome,” and photos show that those Pete taught to sing included both Rosa Parks and Martin Luther King, Jr. I asked Pete about getting him to Salt Lake City for a concert in the 1970s — he demurred, saying he needed to spend some time locally. He told a story about showing up at a PTA meeting in Beacon to talk on some issue, and some local guy told Pete that Beacon didn’t need outsiders telling them what to do. This hurt Pete, since he’d been living in Beacon at that time for more than 30 years, in the house he built by hand. Pete told me that he realized a world reputation doesn’t count for much if you can’t use it to make things better in your home town.The “local project?” He said he wanted to get an old sloop, and sail the Hudson River signing to get people to clean it up. At the time, the Hudson was very much a sewer from Albany to New York City. A short time later the Sloop Clearwater was refitted, and Pete started music festivals up and down the river. The Hudson, Pete’s local river, runs much cleaner today for his work. I saw Pete and Arlo in concert at Wolf Trap, the performance park near Washington, D.C., a couple of times; and some other venues — but nothing ever beat that open air concert at Rising Sun. Bruce Springsteen did us all a favor with his album of Seeger tunes; I chafed at Ronald Reagan’s choices of performers at his inaugurals, and at many other choices over the years. I often thought Pete Seeger’s music, and voice, would be a better choice. Springsteen’s pre-inauguration concert in 2008, from the Lincoln Memorial, had my full attention. The only thing more perfect, I told Kathryn, would be Pete singing his own tunes from those steps (I heard him tell the stories of King’s and Marian Anderson’s performances there more than once). Within a few minutes, Springsteen pulled Pete out onstage, and at the age of 90 he led the crowd singing Woody’s “This Land is Your Land.” A perfect capstone, I thought. If you would, pull out your collection of Pete Seeger music today, and give it a spin. It will raise your spirits, I guarantee. What wonderful gifts Pete left us! So long, Pete, one of the best American citizens we’ll ever know. From Pete Seeger’s 90th Birthday Concert (Clearwater Concert), Madison Square Garden, 5/3/09. 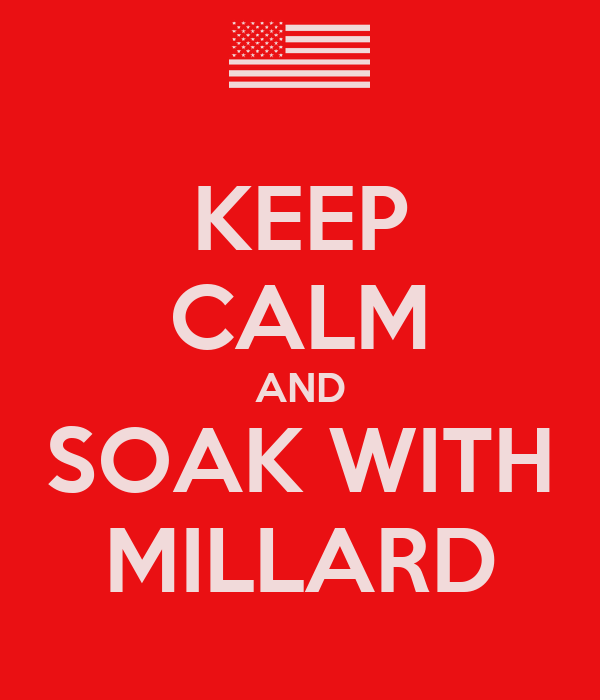 Featuring Billy Bragg, Mike & Ruthy Merenda, Dar Williams, New York City Labor Chorus. A couple of photos I stumbled on recently. The Seeger Family, 1921 Pete Seeger, the now-93 year-old folk singer, is sitting on his father’s lap. 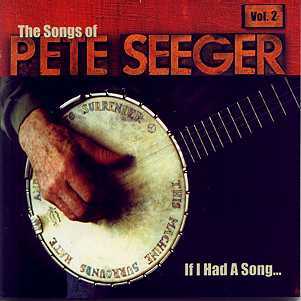 Pete’s father was musicologist Charles Louis Seeger, Jr.; his mother was the violinist Constance de Clyver Edson. The other two children are probably Pete’s older brothers Charles, III, and John. 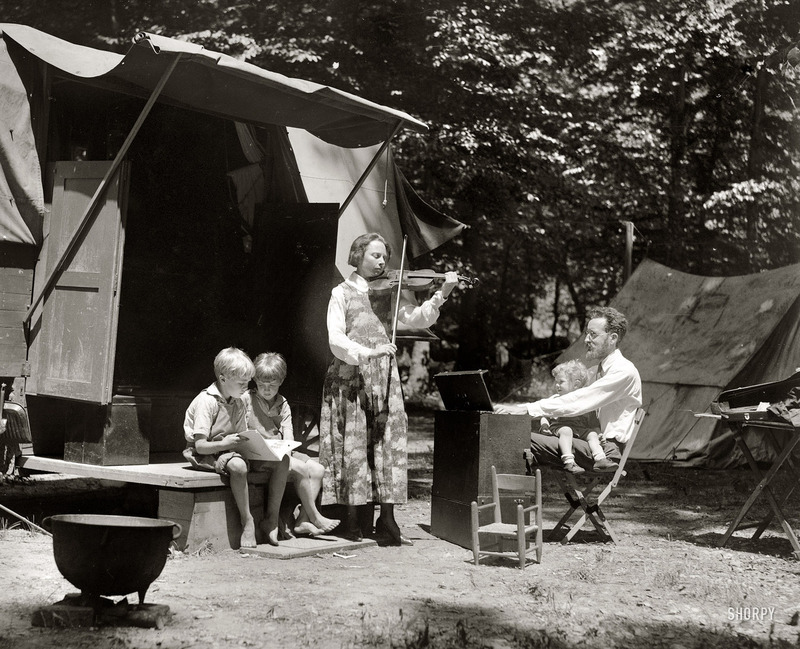 This photo probably was taken while Charles and Constance toured the American south to teach music, after his having to leave UCLA because of his pacifist stance during World War I.
Pete Seeger was born on May 3, 1919. He turns 94 today. Pete is an alumnus of the Louis August Jonas Foundation‘s Camp Rising Sun, a little nugget that appealed to me when I signed up as a counselor at the Rhinebeck campus in 19#&. Pete and Arlo Guthrie teamed up for a series of concerts at East Coast venues that summer, including Wolftrap, Saratoga, Tanglewood and others. Pete lives just down the river from Rhinebeck, near Beacon — but driving home from one of those venues was just a bit too far. Pete stopped off at his childhood haunts and spent a day with us. I hoped to invite him to Salt Lake City. Pete said he might make such a trip, but it was unlikely — and impressed me with his reasoning and dedication to principle. He explained that he was sticking closer to home as he approached 65, because there was work to do there. He said he’d attended a local school board or PTA meeting to voice an opinion on some issue in Beacon. One of the local newspapers complained he was “an outside agitator.” That stung, he said — he’d been a resident in the town for more than 30 years. Instead of complaining, though, he started thinking. He said he’s traveled the world and worked for causes for other people in other towns; and he said he realized that one’s life’s work might be dedicated to making life better where one lives. So he’d decided to campaign to clean up his local river, the Hudson . . . you’ve heard of the Sloop Clearwater? Pete’s dedication to making things better, with local action where one may make a huge difference, stuck with me, and it should stick with all of us. Last month I was doodling around Twitter, and discovered Pete had signed up for a Twitter account — years ago. He tweets regularly. He’s an encouragement to all of us. He boasts that there is no group he has ever refused to sing for, and in his typical humility, he claims that he can get any group to join, so they do all the heavy lifting. During the pre-inaugural festivities for President Obama’s first inauguration I was happy to see Bruce Springsteen singing some of Pete’s work — highly appropriate for any president’s inauguration — and I thought it would be more fitting only if Pete was singing himself. Then Springsteen brought Pete out on stage to close out. Pete keeps up a schedule of concerts, most for causes. He sails with the Clearwater, campaigning for clean water on the Hudson River (much accomplished) and community efforts to change things for the better. As you will see below, he pulls his own when raising the sails. He cuts his own wood to heat the house he built. Considering his age, 94, we might wonder why he keeps going, doing so much all the time. Why does he keep on going? He might be telling us, from this 2012 recording. Some material in this post is recycled from an earlier post.